Fear of Flying, Spider Phobia, Birds, Agoraphobia, Fear of Driving, Needle phobia, Fear of Heights, Fear of Death, Social Phobia, Claustrophobia and more. Fears and Phobias are learned either from such people as parents or significant others in your life. If you are a child and your Mother or Father become terrified at the sight of a spider then it is likely that you will then perceive spiders as terrifying. If you had a traumatic experience this can colour your thinking and reactions. 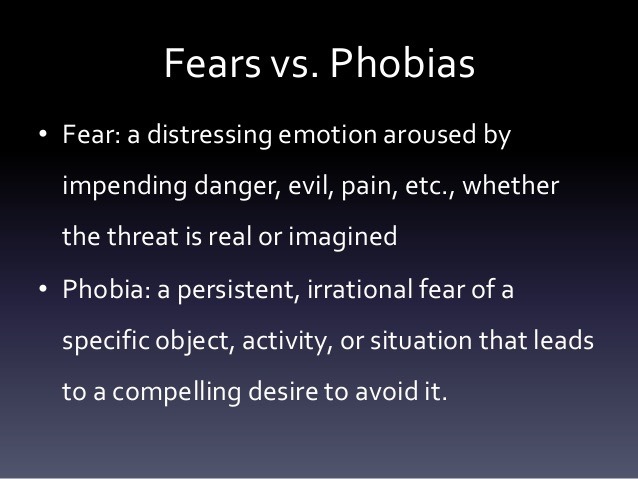 Treatment for Fears and Phobias is by using strategies to handle the fight or flight response and then “reframing” the perceived threat as of lesser concern or none at all. Fear and Phobia can really impact our life – Fear of Flying, for instance, really effected the ability of a Businessman and International Author to travel on Business. He now flies long haul without issue. This is hard wired into us – if we perceived that a sabre toothed tiger was going to attack us it wasn’t much use to stand still – you had to try and fight it or run away – fight or flight – and your unconscious or subconscious processes would give you all the adrenaline required and send the blood to the extremities. This could be useful in some circumstances of real threat – but is inappropriate in many other circumstances. Being stuck in an alley and hearing someone breaking bottles might well rightly give us some fear but when you are facing the wrath of Nigel from Accounts over your small overspending the fear is not appropriate – so we need to get our anxiety of the situation or panic under control. (This is also true of everyday anxiety stress and panic attacks). NLP was developed by Bandler and Grinder who studied the best practice of the best Psychologists Psychiatrists and Hypnotherapists to find a common ground of approach that worked best in treating many issues. NLP proved to be able to treat fear and phobia which seemed difficult and almost impervious to other approaches. They also studied the neurology of learning – in other words HOW people learn but then also HOW people could unlearn habits and get past self imposed restrictions and limitations. NLP also says the “map is not the territory” meaning that your current mindset is not necessarily the be all and end all – that it is possible to change your circumstances by changing your mind. NLP also holds that, as Bandler said: “The Past is over The Future is yet to Come” and that we should be more Mindful of the present moment and use Failure as a lesson to make things better. This is by no means an exhaustive explanation of NLP and it’s effectiveness but it can achieve remarkable results. It is important to state with NLP and Hypnotherapy that results are generally as good as the work done by both Hypnotherapist and NLP Practitioner AND the Client. If the Client has difficulties with the techniques or is resistant to treatment or does not get along with their Therapist then results could be very mixed! It is important to realise that therapy is a journey for both therapist and client to work together and treat any “failures” or mistakes as valuable learning opportunities. I have to say that I only suggested a small test of going up a small height! Fear of Flying, Fear of Heights, Fear of Birds and Dogs, Fear of wide open spaces (Agoraphobia), Fear of Death. PTSD. Social Phobia, Spider Phobia, Snake Phobia, Needle Phobia, Bird Phobia, Dog Phobia, Snake Phobia, Agoraphobia, Claustrophobia, Fear of Vomiting – Emetophobia. Claustrophobia can be unlearned as indeed can all phobias – generally you learned this from someone important in your life a terrified parent scared of spiders .. or maybe an terrible sibling locked you in an under stairs cupboard and though it was funny – as you were terrified in the dark and in an enclosed space. We learn from a bad experience or someone who might be a significant figure when young – this can be treated by undoing that initial experience so it stops driving our current reactions. Treating Fear and Phobia with Hypnosis and NLP with Hypnotherapist in Ipswich Suffolk and Colchester Essex.There is no reason to continue suffering fears or phobias.